We were now being billed as ‘the most televised group in Britain’ and we started 1973 with a seven week television series called It’s All In Life with the comedian Al Read. We sang a track every week from our new album Day Of The Fox. It was released on 9 February and the cover featured a brilliant illustration of a guitar-playing fox by John Ireland. In April we returned to the Savoy for three weeks and then started work on our fourth album. This time we asked Gerry Butler to arrange the rhythm sections. 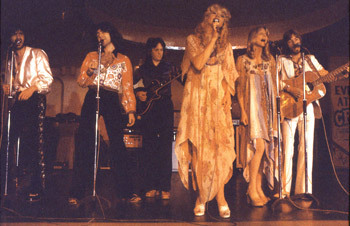 The first session included ‘A Famous Myth’, originally sung by The Groop, from the soundtrack of the movie Midnight Cowboy. We also recorded ‘Dirty Work’ by Steely Dan, as well as two songs of mine, ‘End of the Party’ and ‘Losing You’, and ‘One Sunny Day’ by Ed Welch. This sounded like a possible single, so we finished that first, and it was released on 13 July. It was our first single since ‘Mayday’ a year before and was an attempt to make more of a pop record, with John and Geoff singing the lead vocals. It had a strong chorus but once again it failed to chart. We had always turned down offers of summer seasons but now we agreed to be guest stars with the comedian Tommy Cooper at the Pier Theatre in Skegness. It was for only two months, it was not too far from London, the money was good, and it meant we could stay in the same place for a while. We rented a farmhouse about five miles inland from Skegness and moved in with the six of us and Gabrielle’s two cats. None of us felt happy doing this type of show. 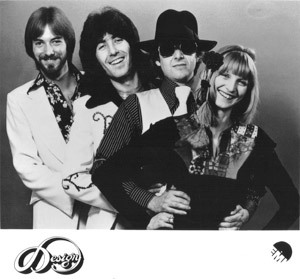 At heart we were still a folk-rock group with a love of intricate vocal harmonies, but we had adapted our music to satisfy the television and cabaret audiences, and the cracks were now beginning to show. Back in London we recorded some radio sessions and taped a guest spot on The Two Ronnies TV show. Then came one of those things that made it all worthwhile – two weeks, all expenses paid, in the Seychelles. We were booked to appear in cabaret for seven nights at the Coral Strand Hotel on the main island of Mahé and to be the guest stars at the Miss Seychelles contest. It was an unforgettable experience. We visited some of the other islands and had drinks with the Prime Minister, James Mancham. At the end of our stay we organised an open air concert for the local islanders at the football stadium, with all the proceeds going to the Old Peoples’ Fund. Several thousand turned up and it was a memorable event. As soon as we returned home we went back into the studio to finish the album, with Herbie Flowers and Gerry Butler in charge of the rhythm sections. We recorded two uptempo tracks written by John, ‘Teach Me How To Fly’ and ‘Wherever You May Go’, and two slower songs by me, ‘After The Rain’, featuring a string quartet, and ‘I’ll Be Back Again’, as well as a great new folk tune by Geoff, ‘I Am The Greene Manne’, and a thirties-style jazz number called ‘Archie Franks’ by Jeff. We also included two songs we liked by other writers, ‘Second Love’ by Dominic King and ‘Don’t Apologize’ by Charles Merriam and Kathy Ward, from the Californian group Sonoma. After that we flew to Scotland and Portugal to appear on some television shows and recorded The Benny Hill Show in London. But Geoff and Gabrielle were now talking seriously about leaving the group and they announced they did not want to do any more cabaret. We had been approached by the Thorndike Theatre in Leatherhead, Surrey, about doing a special concert of An Evening with Design. So we contacted John Robins, who had directed us on TV shows with Val Doonican and Benny Hill, and he agreed to produce and direct our performance. He brought along his lighting and sound technicians, and the choreographer Berry Cornish, and we created a totally new stage act, including songs from our albums, dance routines, and even comedy. The concert took place on 17 February 1974 and the theatre was sold out well in advance. The whole evening was a complete success. We proved to ourselves that with the right musicians, staging and direction, we could be as good as anyone. Now all we needed was a hit record. Our seventh single ‘Second Love’ was released on 11 February. One reviewer wrote: ‘Despite all the hazards of predicting what will be hit singles, I haven’t got the slightest hesitation in saying this is going to go right the way up to No.1. It has everything it needs for success – a beautiful melody, fine harmonies and excellent lyrics.’ But Rosemary Horide in Disc summed up the general reaction: ‘The nearest Design ever got was "Love Is" and since then they’ve been moving further away. Not a hit, and unless they put a bit more guts into something, they’ll never have one.’ Unfortunately, she was right. It was time for a change. John Robins introduced us to John House, who had worked with Emerson, Lake and Palmer, and we thought he would be the ideal manager for us. We informed our agents, John Coast and Frank Powis, that we wanted to leave them and they kindly agreed to let us go. Within a fortnight John House had also terminated our production deal with Adrian Kerridge and Syd Dale at Motive Music and negotiated a new recording contract with EMI Records. On 26 April we released a second single from the In Flight album. This was ‘Losing You’ and it picked up some good reviews but almost no airplay. Disc wrote: ‘An absolutely beautiful single from this most unrecognised group … Do us all a favour and buy it, because you won’t regret it. Fantastic.’ It was our last single to be produced and arranged by Adrian and Syd. It had a beautiful arrangement but once again it lacked the right ingredients to be a hit. On the day it was released there was a full page article in Record Mirror with the headline ‘Who’s The Cleanest?’ The New Seekers had split up a few weeks earlier and the battle was on to see who would take over from them as the next big vocal group. We were tipped as the main contenders, along with Springfield Revival and Rain. Under the heading ‘Designs on the top spot’ it concluded, ‘Design’s distinctive compositions, unusual arrangements and soft harmonies make them hot favourites as the New Seekers successors, but only time will tell.’ However ex-New Seeker Lyn Paul did not mince her words: ‘Design? No, they haven’t the talent. That sounds horrible, but what I mean is they just haven’t got the vocal sound’. Our fourth album In Flight was released on 3 May. We chose the title after realising that half the songs on the album mentioned flying. At first we commissioned John Ireland to draw another cover and he produced a fantastic drawing of Pegasus, the flying horse. But we decided it would make more sense to have our pictures on the cover. We hired Edwardian clothes and had photographs taken at the Old Warden Aerodrome in Bedfordshire, where they have a unique collection of early aircraft. Afterwards we went for a drink in the local village pub, still dressed in our costumes, and that became the picture on the back cover. In June we were invited to represent Britain at the Ljubljana Song Festival in Yugoslavia, which was then still a communist country. Most of the countries in Europe were taking part and the final contest was to be televised live across Europe and the Soviet Union. We were also chosen to perform a live half-hour show with the festival orchestra in the huge Tivoli Hall, which was also televised. The songs were all written by Yugoslav composers and ours was called ‘Potepuh’, meaning ‘The Tramp’. It was voted into third place by the audience, which won a prize for the composers of the song. On 16 August our ninth single ‘Sing The World A Song’ was released. It was written and produced by Tony Hiller, best known for his work with Brotherhood of Man. It was a great improvement on our previous few singles. We sang it on several TV shows, including The Golden Shot, and Radio Two chose it as ‘Disc of the Day’, but we could not get it played on the all-important Radio One, and it was another miss. Next we appeared for a week as guest stars with the legendary American singer Josephine Baker at the London Palladium. Then Gabrielle dropped a bombshell. She announced that she was leaving the group to get married. We had hardly met her new boyfriend, a Canadian, but her mind was made up and she gave us one month’s notice. First, we had to fly to Holland to promote the single on a TV show called Bingo. Then we had four theatre shows booked with Morecambe and Wise in Southampton and Blackpool. We had not told anybody Gabrielle was leaving. Our last performance as the six-piece Design was at the Opera House in Blackpool on 26 October 1974. Afterwards we agreed that Geoff would leave the group at the same time, and we would carry on without them. 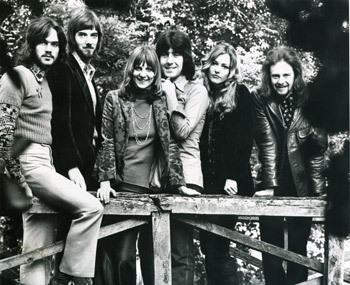 At the end of November, Design were pictured in New Musical Express as one of Radio One’s Pick of the Year – their tips for the top in 1975. Tony Blackburn had chosen us, saying: ‘They fill a slot with the departure of The New Seekers and appeal to both youngsters and their mums. 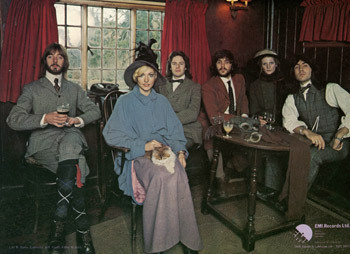 Now the only thing they have to do is get the right song.’ The photograph had been taken in August – not knowing that by the time it was published, two of the group would have left. We auditioned several girl singers to replace Gabrielle but it soon became clear that no one could match her looks or her voice. We decided to carry on as a foursome, but with a permanent bass guitarist and drummer so that we became a self-contained unit. We still had our recording deal with EMI and over the next two years we released four singles and our final album By Design. We continued to appear in cabaret and did a nationwide tour with The Hollies, including a night at the Royal Albert Hall, and a summer season with Freddie Starr in Bournemouth. But it was never the same without Geoff and Gabrielle, and after two years we decided to call it a day. On 3 November 1976 we recorded the Alyn Ainsworth Show for Radio Two and then we went our separate ways.